Who is the "mighty angel" of Revelation 10? Chapter 10 of Revelation brings a halt to the chronological action in the book. This is what I call "the rhythm" of the book of Revelation. The action builds — the terror mounts — it gets worse and worse, and then, all of a sudden, it comes to a screaming halt, and a parenthetical passage is inserted to assure us that everything is going to work out all right. After all, by the time you get to the end of chapter 9 the world situation looks pretty grim. So, chapter 10 is a parenthesis that presents a flash-forward to assure the reader that everything is going to turn out okay in the end. John suddenly sees a very unusual angel — a "strong angel." 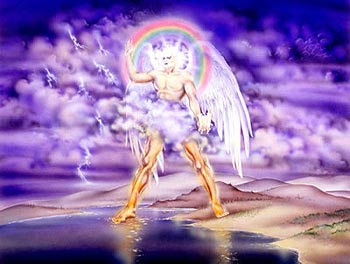 The angel is clothed with a cloud, he has a rainbow upon his head, his face is like the sun, and his feet are like pillars of fire (10:1). We know this is Jesus because He is clothed with a cloud which is a representation of the Shekinah glory of God. Further, He has a rainbow upon His head, and chapter 4 reveals that's the symbol of faithfulness that crowns the throne of God. His face is like the sun. That's right out of the description of Jesus in chapter 1 (verse 16), as is the reference to His feet being like pillars of fire (1:15). The clue that clinches the angel's identity is in verse 2 where we are told that He has a little scroll in His right hand which He holds up as He claims possession of the earth. In chapter 5 we learned that Jesus was the only one in all the universe who was qualified to take that scroll from the hand of God the Father. What we have here is another flash-forward to the end of the Tribulation to assure us that everything is going to turn out all right. Jesus is going to return in triumph to claim the earth for the children of God. Some object to identifying the angel as Jesus because they argue that the angel makes a vow upon the name of God (verse 6). They ask, "How can this angel be Jesus, who is God in the flesh, if he makes a vow in the name of God? Can God make an oath in His own name?" The answer is yes. In Hebrews 6:13 we are told that when God made a promise to Abraham, "He swore by Himself" because "He could swear by no one greater." Likewise, in Jeremiah 22:5 God says to the prophet, "I swear by Myself." (See also: Isaiah 45:23, Daniel 12:7, and Amos 4:2 and 6:8.). if you're a liberal, you recognize your angel, the one on the cover of newsweek magazine with a rainbow halo...the first queer president. this post should not be deleted or berated. as dr. reagan pointed out in one of his articles...gays were known as queer in his day...that is where i get my reference to that word. and if you think about it...the sight of two men kissing, to any straight person, is a queer thing indeed. queer and disgusting. in the eyes of God it is an abomination. I think that the queers making the rainbow their symbol has to be infuriating to God. Another reason there will be no homosexuals in Heaven. An if you object to my use of the word "queer" know that I apply that to those that have rejected God's will and rebelliously partake in activity that God says is an abomination. And all I'm doing is calling thier behavior by a correct description...queer. Male-male and female-female relationships is queer aka not normal. I simply name call. God will judge and send them to Hell. So if you object to me using this word to describe a God rejecting abomination of a person then how much more do you object to God sending that person to Hell? What has led me to use such a term is prompted by a video on Youtube of Christians trying to bring the Word of God, the Word of Salvation, to homosexuals in San Francisco and the queers indescribable attack on the Christians. They shout the most vile and evil things. You should watch it. This is the most telling video of what happens to a person when they completely have chosen to reject God and his standards and become perverted and evil. Christians coming to them in love hoping to bring them to Jesus are treated as the evil scum with devilish hatred and vile profanity. That is who I am referring to with the term queer. One, the behavior itself. Two, the person that has completely and utterly and eternally decided to reject God. ALL who put their faith in Jesus to save will stand before God washed in the Blood of Christ and dressed in His robe of Righteousness which Jesus exchanged for our UNrighteousness. When we are faithless HE remains faithful and NOTHING can separate us from the love of God - that includes all post salvation sins. Even a life long do gooding charity worker will end up in the lake of fire for NOT putting their FAITH in Jesus to save them from sin.